Pastor Rob Morris of Newtown's Christ the King Lutheran Church provided the closing benediction at an interfaith event following the Sandy Hook school shooting in Newtown, Conn., on Dec. 16. Published at 6:33 a.m. ET: A Connecticut Lutheran pastor has apologized for participating in an interfaith prayer vigil for the 26 children and adults killed at a Newtown elementary school in December because his church bars its clergy from worshipping with other faiths. The December prayer vigil was attended by President Barack Obama, leaders from Christian, Muslim and Jewish faiths, and relatives of the 20 first graders who were gunned down in their classrooms two days earlier after a gunman entered their school. The Dec. 14 shooting shook the nation and led to calls for improved school security, gun control and better mental health care. 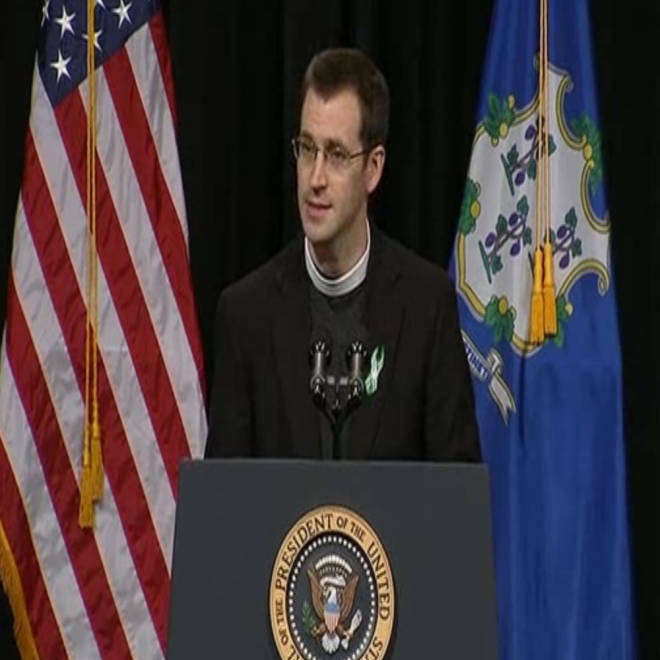 Watch the entire interfaith vigil for Connecticut shooting victims, including President Obama's speech. Pastor Rob Morris gives the closing benediction, beginning 73 minutes, 10 seconds into the video. The pastor, Rob Morris of Newtown's Christ the King Lutheran Church, provided the closing benediction at the interfaith event on Dec. 16. Earlier this month, the president of the Lutheran Church-Missouri Synod, Pastor Matthew Harrison, wrote a letter to church members saying he had requested an apology from Morris for his participation in "joint worship with other religions." "There is sometimes a real tension between wanting to bear witness to Christ and at the same time avoiding situations which may give the impression that our differences with respect to who God is, who Jesus is, how he deals with us, and how we get to heaven, really don't matter in the end," Harrison wrote. "There will be times in this crazy world when, for what we believe are all the right reasons, we may step over the scriptural line," he wrote. Harrison said he had accepted Morris' apology. This is not the first time a Lutheran leader has been chastised for participating in a community service in the wake of a local tragedy. David Benke, a Lutheran pastor in New York, was suspended for praying at an interfaith vigil in 2001, 12 days after the Sept. 11 attacks on the World Trade Center. Benke, who had refused to apologize for the incident, was reinstated in 2003. In his own letter to his church, Morris wrote that it was not his intent to endorse "false teaching" and apologized to those who believed he had. "I did not believe my participation to be an act of joint worship, but one of mercy and care to a community shocked and grieving an unspeakably horrific event," he wrote. "I apologize where I have caused offense by pushing Christian freedom too far, and I request you charitably receive my apology." Fierce debate after Newtown school shootings: Where was God?